Voe por uma floresta de ilha acima de mangueiras e bambus em uma emocionante aventura de tirolesa em Kauai. Atravesse a copa das árvores em uma série de cabos e pontes sem nunca tocar o chão, sentindo a brisa do Havaí em seu rosto e admirando a vista da montanha ao longo do caminho. Para um grand finale, solte-se em um balanço gigante de Tarzan ou teste suas habilidades de escalada em uma parede balançando. This was my first experience of ziplining. The guides were very patient and helped me to have a wonderful time. 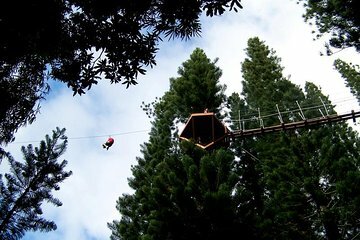 My husband and I went to do this zipline treetop tour for the first time on Sept 6. We arrived early to Harbor Mall to park the car, and right on time, we took a van to the place were the ziplines are located. It only took us around 10 min to get there. Tony was our driver and he was wonderful all the way. When we arrived Erick and Derek received us there. They looked very young and fearless, but they were very serious with security measures, and very professional. Derek and Tony went with us the whole time they tough us about all the safety measures you are always secured to a cable and all the tips to make the experience fun. The rides were amazing. At the beginning I was really afraid, but at the end I wished there were more ziplines to do! My husband also did the Climbing Wall and the Monster Swing and he really had a good time. Those two were a little bit extreme for me, but the team made sure my husband was always secured and could enjoy the experience. I really recommend this tour. It was amazing!! Was skeptical of doing a zip line. The crew was excellent, made the day very fulfilling. Will be doing zip lining again beccause of the experience. This adventure was awesome, Stuart and Jordan were very patient and great guides. Highly recommended! We were picked up at the Harbor Mall and driven to the site about 15 minutes away. Upon arrival we met our guides Jordan and Scott. The set us all up with helmets and harnesses. We did training about how to hook and unhook our safety lines. Once we started we stayed in the tree tops for the tour. Our guides were great. Scott was hilarious and Jordan kept things moving They both were extremely nice The zip lines and bridges were good but nothing too scary. My husband and I had a good time and enjoyed getting to know not only our guides but the others in the group.